Aaah, Easter. Another holiday, another excuse for chocolate, right? 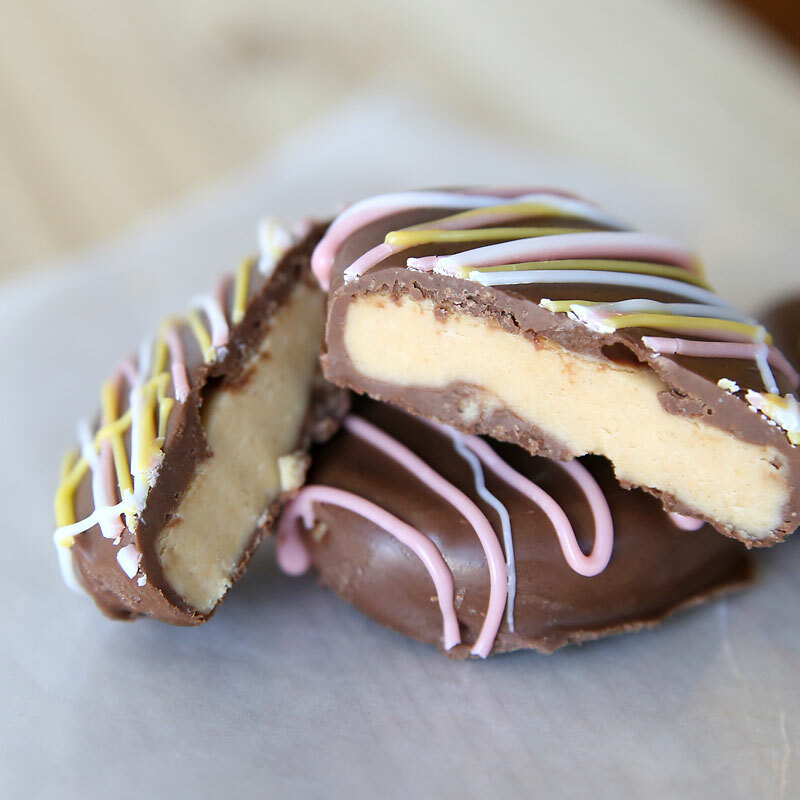 Way back when, Sees Candies used to sell all their holiday merchandise for half off starting the day after the holiday, which meant we’d head in the day after Easter to load up on peanut butter eggs. Much like the Reese’s variety, but even better. 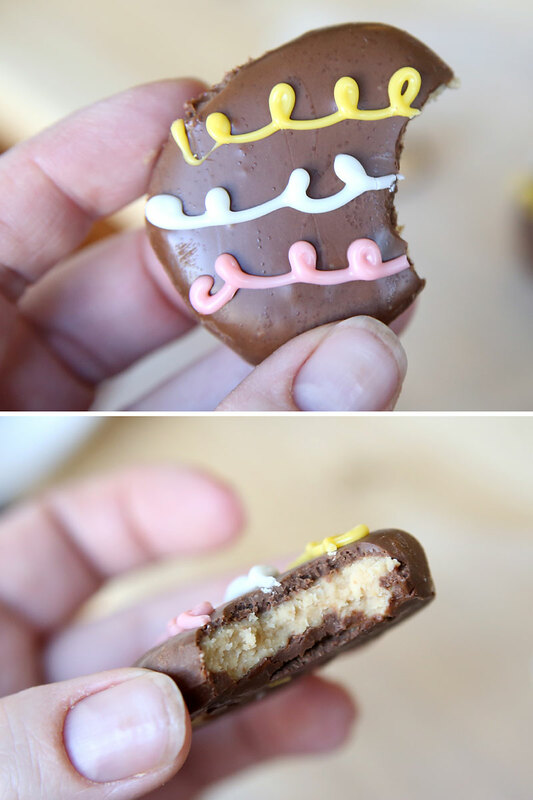 Alas, no more half off holiday clearance (last I checked) but the good news is you can make chocolate peanut butter eggs at home with only 4 ingredients. Easy and delicious. I’m not kidding about the delicious part. The only problem now is trying to figure out how to stop eating them. You can make these any size you want. I pinched off maybe a tablespoon’s worth for each egg and placed them on wax paper after I shaped them. I ended up with about 25-30 eggs. You’ll want to freeze for about 10 minutes after shaping. During the freeze, melt your chocolate. 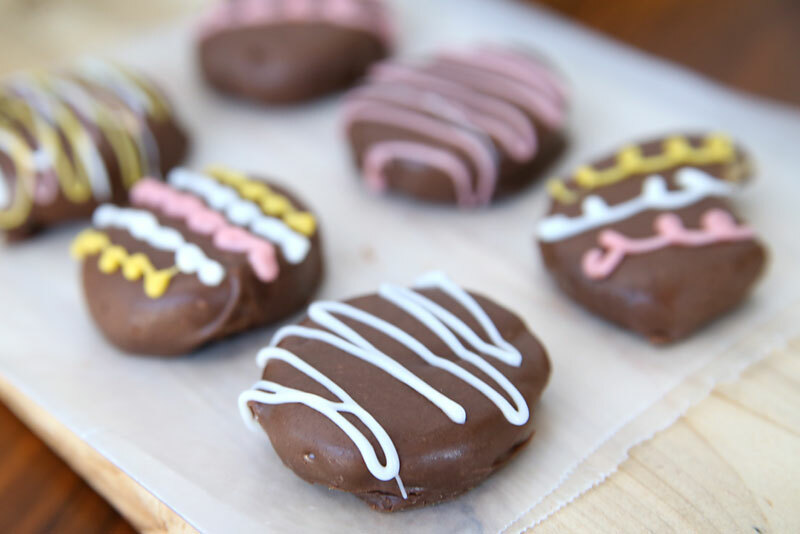 For the shiniest eggs, you might want to use chocolate candy melts. I don’t like the taste of chocolate candy melts so I use Hershey chocolate chips instead. To get a good finish on chocolate that’s not specifically designed for melting, you need to temper it. Read this post for an explanation of a quick and dirty method for tempering that doesn’t require a candy thermometer. This method works well, but as you can see from my photos you may still get a few “speckles” as the chocolate dries. Dip the eggs in the chocolate, working quickly so the chocolate doesn’t get too cool. Use a fork to fish the egg out of the chocolate, and tap it a few times to shake off the excess chocolate. Then use a toothpick to slide the egg off the fork onto wax paper. Before the chocolate sets up, use a toothpick to “trace” around the eggs on the wax paper. That way, when you pick up the eggs after they have set the excess chocolate will break off in a clean line around the egg. Let the chocolate set up completely at room temp or in the fridge. Decorate as desired. I used melted candy melts in sandwich bags with the corner snipped off to “pipe” designs on the eggs. Peanut butter and chocolate, my favorite! 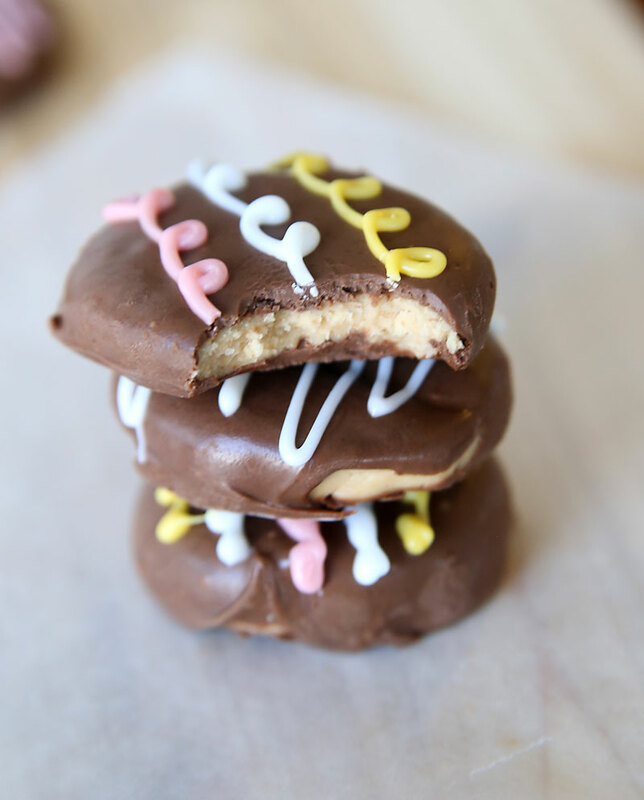 Those look delicious, and who doesn’t like peanut butter and chocolate! My husband would just die if I made these for him! 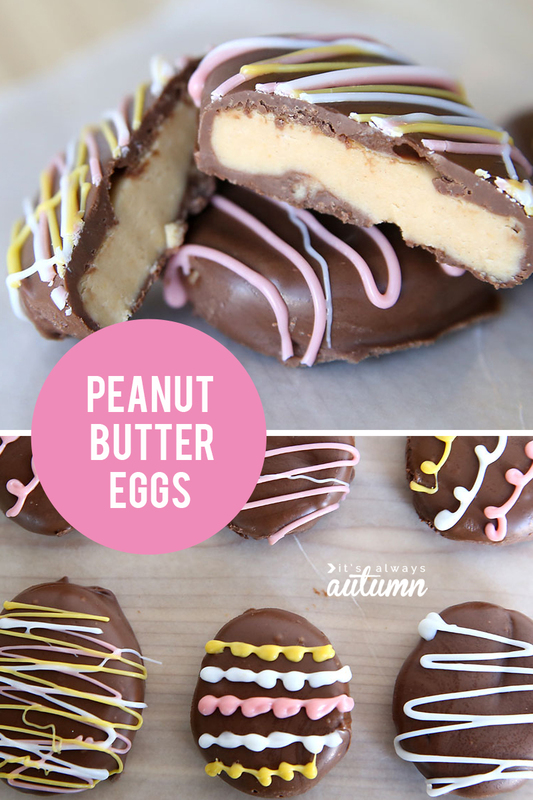 You had me at peanut butter ♥ Those look delicious!!! I’m trying these out tomorrow! They look delicious! I’ve made these and they are absolutely incredible!!! Hello, how are you? I had feature your delicious recipe in my blog (www.myhousetucasa.com/en) , I hope you don’t mind. Have a nice day! You are amazing! I love everything you create and every project/recipe is always a success. Thank you for your creativity and gift for sharing!